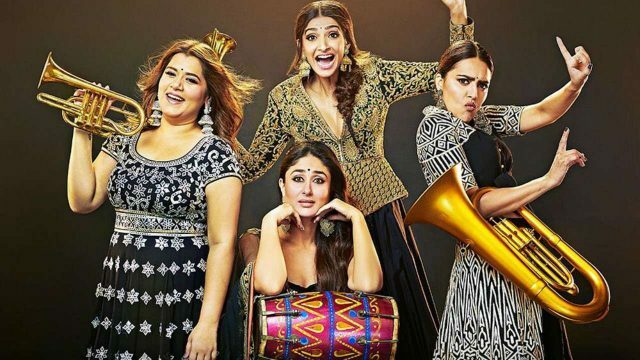 The block buster comedy film ‘Veere di wedding’ which was released before a fortnight is still getting a great fame and success and has been proved a blockbuster movie one of the 2018 Bollywood movies. Not in India but in many other countries it is getting a big applause. As we know that ‘Veere di wedding’ earned Rs 64 crore in 9 days and still it is rocking in cinema halls and theatres. If we talk about its 11th day it added Rs 2.03 crore in its total box office collection and still it can’t imagine that for how long it will be in Top Headlines. The film ‘veere di wedding’ is full of comedy and emotions. The story of this film revolves around 4 friends who have their own complexities regarding their life. The main issue is marriage.T hey are childhood friends and when they meet after years they notice the changes that someone have married,some have divorced and some do not want to marry. Its content is fascinating the fans and it gathered speed on even second sunday and monday after its release date and now stand at total Rs 71.71crore( nett) till Tuesday. This movie is not rocking in india but has a great impact worldwide. From producer to sonam kapoor’s sister all are celebrating it as a great victory and ON THE RED LETTER DAY of Sonam’ s 33rd b’ day her sister not just wished her but also expressed her gratitude. So it is a great occasion for all the team and this credit goes to all the team and their hard work the critics and reviews for the movie are fabulous. After its succession it has decided to make ‘ veere di wedding 2 ‘ and according to reports it has been found that Actress Kareena Kapoor khan will not work for it . Will kareena kapoor khan be replaced by another actress? Or the story will revolve around 3 castings.